The co-producers of the ‘Sam the Wheels’ project are Mutiny Arts (aka George Butler and Tom Keene) and 198 Contemporary Arts and Learning. Together they invited and enabled a multitude of response through a collaborative website, exhibition, publication and series of events. The resulting multi-layered project brings a fresh reinterpretation of recent history by partnering artistic and critically engaged approaches with a diverse array of social and cultural perspectives. 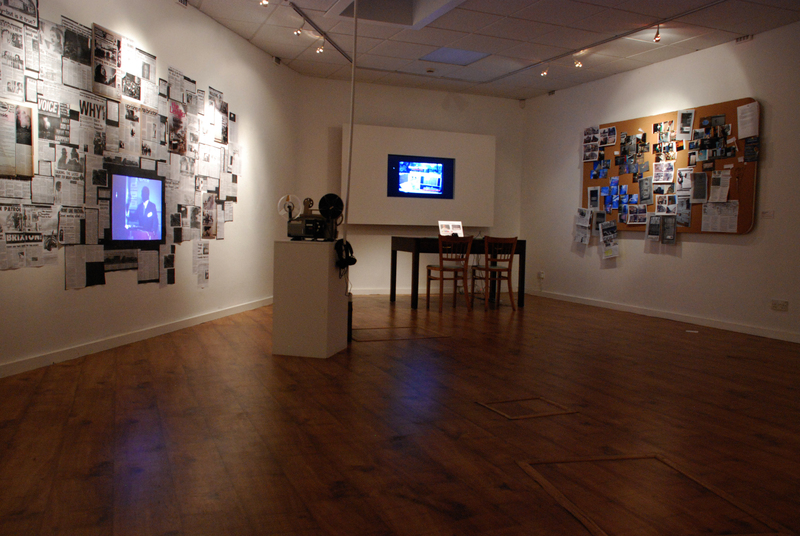 Currently live at www.samthewheels.co.uk the website provides a collaborative space to post text video and images, acting as an archive of: materials, thought and process throughout the life of the project. Tim Blake: Installation exploring the origins of multi cultural Britain in Brixton. George Butler & participants: Video project researching groups active on Railton Road (the epi-center of the Brixton Riots) including; The Black Panthers, Anarchists, Activists and Rastas. Nada Prlja: Jesus dies for our sins (Neon sign - explores church spaces being used as something else). George Amponsah & participants: Youth documentaries (short films exploring the sus-laws & other subjects). Video has been digitized and is accessible via www.samthewheels.co.uk/170 It is also to be deposited with the Black cultural Archives, Lambeth Archives and the Internet archive. We led a series of workshops over summer/autumn 2008 where we viewed Sam’s footage, discussed and researched its origins and developed ideas/themes further explored through creative projects, shared skills in video production and web technologies. Acting as both a ‘keepsake’ for the project and an opportunity to engage a wider audience with archive materials, ‘Process’ and themes explored during its development. This unique project combines historic and contemporary documentary film, visual arts, collaborative web based technologies and grassroots community action. The purpose is not just to conserve and publish rare film footage of 1960s, 70s and 80s Brixton but to bring it alive in communities now, and create a space for people to interpret and reinterpret it in ways that are relevant to their challenges and experiences today. In Brixton from the late 50s to the present day, Clovis Salmon aka ‘Sam the Wheels’ has captured accounts of everyday life, protest and people, offering a lens through which the struggles, sufferance and joys of those times can be seen with an authenticity uncontaminated by a media agenda. In sharing his historic footage, Sam has served as a living lens on those times, offering his own experience of arriving in London during the 1950s as the catalyst for a community arts and heritage collaboration that resonates with present day Brixtonians and beyond. Sam’s film, ‘The Great Conflict of Somerleyton Road’, follows the story of Jesus Saves, a Pentecostal Church demolished to make way for the ‘Barrier Block’ on Coldharbour Lane, concluding with the aftermath of the 1981 Brixton Riots. It reveals the important role churches played for new Caribbean communities who built their own places of worship and social spaces after being excluded from English churches, pubs and clubs. This project engaged artists, activists, documentary film makers, curators, volunteers, youth groups, poets, writers, technologists, community figures and others in a rich creative explorative process over the last year. Funded primarily by the Heritage Lottery Fund, the project has drawn on film, photography, arts, web and community development techniques to directly engage people in a co-production that is at once historic and contemporary; factual and artistic; educational and entertaining; personal and communal; above all, interactive and engaging. Sam’s 8mm celluloid films were first digitised, then presented in a series of events and workshops, which ran alongside four artists’ commissions. George Amponsah and George Butler, both with origins in documentary film, worked with volunteers and young participants to tell stories and trace ideas of identity, belief and belonging and Nada Prlja learnt about the varying importance of religious ideology within Brixton’s culturally diverse population. And in Tim Blake’s own words “The more I travel the more I realise what an amazingly diverse place London and a lot of England is, OK this may be something to do with our “old Empire” but as Ghandi said “No culture can live if it attempts to be exclusive”. A core group of local residents aged between 10 and 80, including Sam himself, volunteered their time and made the project come alive through discussion, researching his own narrative, his films, local places and people. They shared their thoughts, findings, films and photographs on a website created with myself, that acted as a sketchbook and sounding board for their discoveries. Rather than attempting to create a definitive archive, its focus was on collecting snippets of information, recording the collaboration, then retrospectively making sense of what has been shared. 9th Feb 2009 6-8pm, film screening. Tate Modern. A screening of the edited highlights of Sams films and an introduction by the man himself. 20th Sept 2009. An edit of Sam’s films shown at the Urban Green \@ 3pm in the Solar Cinema. Dec 2008 to 21st Feb 2009. 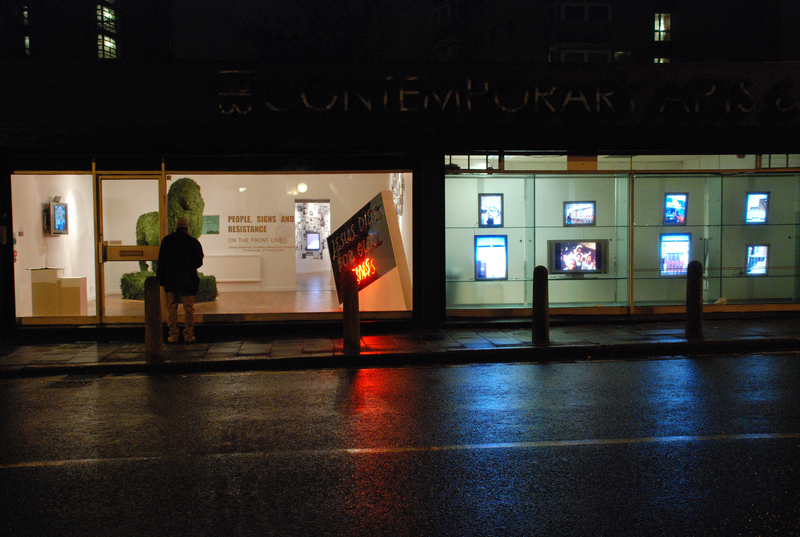 Exhibition “People Signs & Resistance: On the front line” at the 198 Gallery in Brixton. 14th Jan 2009 7-9pm Publication launch. We will be having a Brixton themed poetry slam hosted by Michael Ryan. To register your interest in participating email barby@samthewheels.co.uk. 28th Jan 7-9pm 2009. An evening with Sam 2009. Clovis Salmon AKA Sam the Wheels has seen many wonderful things through his camera come and join writer Michael McMillan for an evening of relaxed conversation and music with Sam and friends. 11th Feb 7-9pm 2009. Discussion evening 2009>. With more government control over our lives and our means to express ourselves politically, where are the new spaces of resistance? A round table discussion where artists, writers, young people and political activists come together to discuss this issue.